Excuse me if I asked silly questions. In process 4, the egg white is folded into which materials? In process 8, can you draw 3 lines in the photo so we can understand where the 3 cut locations. Can I mix in the flour and oil with the egg yolk and fold in the egg white to the mixture? I'm afraid there will be too much stirring to add the flour and oil to the egg white mixture. This is the most difficult part, can you give me some tips? Yes, you can mix in the flour and then the oil in the wet ingredients. Lastly, fold in the egg whites. Actually, I used this procedure before. But, testing my friend's recipe, it's quite ok for the final mixture. You're right that this recipe yields quite a lot of stirring. That's a challenging part. Go for the safe route that you're comfortable if you have tried successfully before. CHRISTINE, 其實FOLD IN係唔係即係用個刮由大碗的一邊插到底, 不斷把碗底層的混合物搞上表層呀? FOLD IN點樣先叫完成呀? The egg white is folded into the egg yolk mixture. I've updated the photo. Hope it helps. it looks amazing!! but what are the 3 lines for??? what happens if you don't cut those lines? If you don't score the 3 lines, that's no problem. Just help you start rolling up the cake easily. 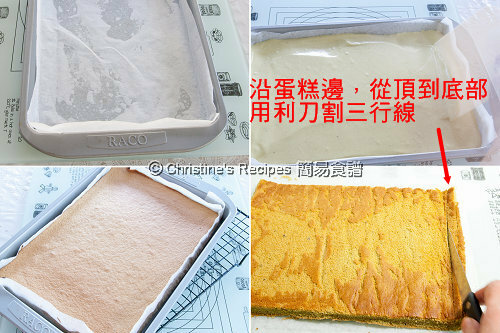 HI CHRISTINE, MAY I KNOW IS IT THE NORMAL(WHITE) SUGAR CAN REPLACED BY BROWN SUGAR WHEN MAKE CAKE OR BREAD? But beware of the fact that the colour of brown sugar will change the look of the end products if it's too dark. Normally, the caster sugar (the fine sugar) will be better as it's easily dissolved and mixed with other ingredients. What do you mean by 忌廉（鮮奶油 whipping cream)?! Is that same as the whip cream that you used on your milkshake drink. And, then you add sugar to it & blend it well. Whipping cream is for cooking and making dessert, in the fridge section of supermarkets. You can use thickened cream as well. Just beat the cream with an electric mixer then add sugar, continue to beat until it thickens to your liking. 我打到係liquid狀....再打就過度打發, 有粒粒ar... >.< 我已經雪左個兜同埋搞伴器入雪櫃, 但係都5得......點解ge...? 我用總統牌 ge whipping cream 囉.....咁係屬於light cream 定係thickened cream? What is 粟粉? Is that same as cornstarch? Are you living in North America? Yes, it's pretty much the same as cornstarch. 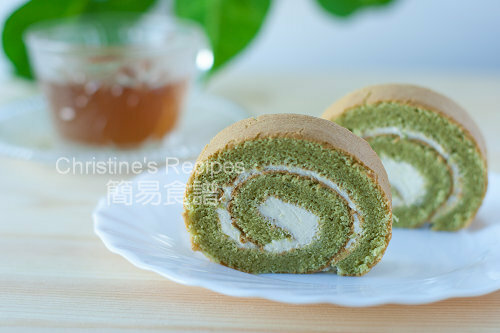 I currently live in the U.S.
After I saw your recipe I wanted to make this swiss roll so bad, because it looks so delicous. And, one more question, in your recipe, when you said plain flour, do you mean all purpose flour or cake flour? Sorry for the questions. We call it "plain flour", that's the same as "all-purpose flour" called in US. Thank you very much for answering all of my question, and now I am ready to make my swiss roll. can i use aluminium foil/wax paper in stead of baking sheet? thanks! Thanks for your recipe, Christine. I like them so much that I really wanna try all of them. I wanna ask what is the difference between thicken cream (or light thicken cream) and whipping cream? Basically, they are different in consistency and fat content. You might like to check out the details of the ingredients on the packets. Christine, is it ok if i omit the corn flour in the recipe and replace the quantity with plain flour? By the way, what is the purpose of the corn flour? Christine, i love this swiss roll. In this recipe, can i reduce the egg yolk from 9 to 6 (or 5)? i have high cholesterol problem. 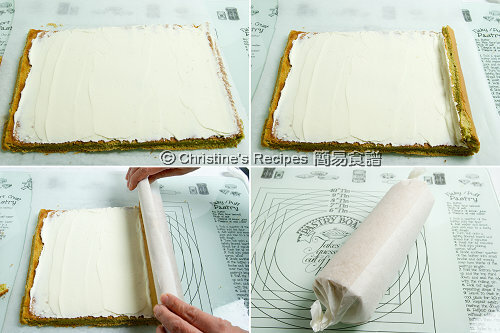 By adding the corn flour, you'll get softer swiss rolls, and help to roll the cake easier. You might decrease the amount of egg yolks. The taste might be changed a bit though. Christine, just read your note on the difference between bread flour, all purpose flour, cake flour and corn flour. Very informative. Thank you. After understanding these useful information, i was just thinking, can i replace the plain four & corn flour in this recipe with cake flour instead? The ratio of plain flour and corn flour in this recipe is about 4:1. So can i just use cake flour? Thank you in advance. Yes, just use cake flour, it's more handy. Thank you, Christine. You are awesome. if i don't have that kind of cloth to roll the cake, what can I use to instead and also keep 'skin' stay not be tear off? You might use non-stick materials, like baking paper, but make sure it could let the moisture of the cake escape. just wondering about the green tea powder, did you buy it from Yuen's market? just wondering the whipping cream I can't found at Coles yesterday, i just saw whipped cream and thicken cream. Can I use thicken cream instead of whipping cream?? Is whipping cream can find at fridge area?? Yes, you can use thickened cream. It's very suitable for whipping. But don't use "lite" cream for whipping, coz it's very hard to beat until soft peaks formed. At Coles, you might notice there's a brand called, Pauls. Pauls' pure cream is very suitable for whipping too, without any other ingredients added, very natural, fragrant and tasty. I like it very much. I tried your swiss roll and it turned out very good! Thanks. I have one issue though. I put a pachment paper on a towel, then turned the cake upside down onto the pachment paper to cool off. But when I unroll the roll, the nicely browned crust got sticked on the pachment paper so I don't have a nice outside crust as yours. How can I fix it? Seems that parchment paper doesn't work so well for rolling up this cake, as the moist is trapped inside and makes the cake roll skin sticky. Try using a clean tea towel, far more better than parchment paper or baking paper. I sons don't keen on green tea and I couldn't buy green tea powder in the UK. Can I put like Coco powder and what's the amount I should add. 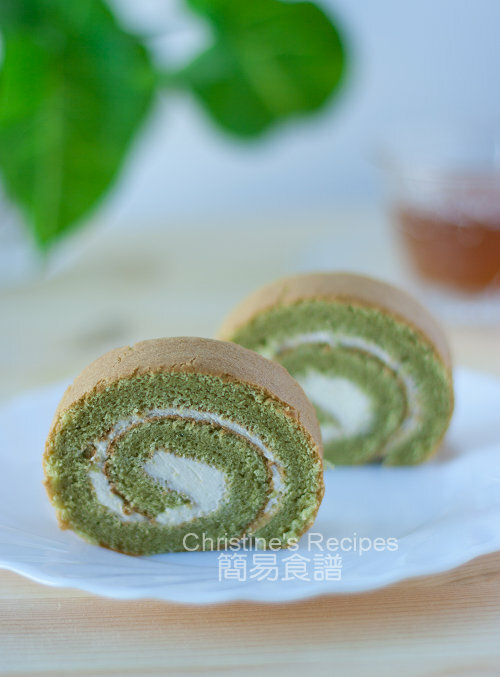 If I make plain swiss rolls, shall I follow this recipe and ignore the green tea powder. You might use cooking oil instead, as long as its flavour is not overpowering the whole cake. 我想問應該roll it when it's hot or cold? thx~ 我剛按食譜做了一次, 好好吃的說~ 不過對我爸媽來說太甜了, 所以想問一下, 可否將糖的份量減一半? 這樣做出來會不會影響整體的味道? 1/2 half cup whipper cream is how many ml ??? I had followed the recipe on the amount of plain flour and corn flour, but my swiss roll is still not soft enough,how can I improve? The steps of beating and folding-in the egg whites are very crucial, that makes the cake roll very soft. Please refer to the tutorial video links on the sidebars of this blog. Hi Christine, 請問做蛋糕用嘅蛋係咪都係用室溫嘅好d? Thank you!